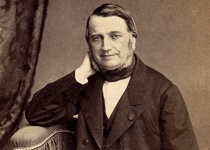 Dominique-Alexandre Godron was a French physician, botanist, geologist and speleologist born in the town of Hayange, in the département Moselle. Author, with Jean Charles Marie Grénier (1808-1875) of the three-volume "Flore de France", a work on flora native to France and Corsica that was co-written with botanist. "Before Mendel, he discovered the main features of hybridation. In "de l'Espèce et des races dans les êtres organisés" he also demonstrated that hybridization in the vegetal world was, against the dominant thinking at the time, similar to hybridization in the animal world." (Wikipedia - en). Also see Hybridizer. GRÉNIER Charles et GODRON Dominique-Alexandre: Flore de France ou description des plantes qui croissent naturellement en France et en Corse, Tome 3, 1855: p. 239: Iris chamæris; p. 240: Iris lutescens, Olbiensis Hénon; p. 241: Iris germanica, florentina; p. 242: Iris pseudacorus, fœtidissima; p. 243: Iris spuria, graminea; p. 244: Iris sibirica, xyphioides; p. 245: Iris Xyphium.